I have published a number of transmitting balun designs, and none of them use enamelled wire. I am sometimes asked why is that so, but more often advised that it is a better solution than the wires that I have used. Enamelled wire depends on an insulating coating, and its breakdown voltage depends on the wire diameter, polymer used, the minimum thickness applied, coating cure / bake processes, temperature, humidity etc. Whilst I have seen specifications promising breakdown voltage of a single round enamelled wire in the regions of 5-10kV, and you might hope for nearly double that between a pair of twisted wires, unless you have source specific product, new performance may be closer to 2kV. there is little warning of failure, leakage current increases a little (~20µA) and then it fails totally. Note that 20µA at 5000V is 100mW and if that occurred in a very small region, the insulation would be heated leading to failure. Failure invariably leaves black marks and on subsequent tests it will flash at the same point at lower voltage. It is true that larger sides of enamelled wire that are close wound (ie touching through their entire length) achieve lower Zo that with other insulations, but it is achieved at the expense of loss (principally caused by proximity effect at extremely small conductor spacing). So what does all these mean for transmitter baluns? If the balun is used in an antenna system subject to high voltages, or even uncontrolled impedance (and hence voltage), eg the so-called “random wire”, then it is inevitable that the balun insulation will be subjected to extreme voltages… a question of when rather than if. Various ‘improvements’ are used to attempt to reduce the chance of flashover, one is to sleeve one of both conductors in PTFE sleeve, another is the sleeve the twisted pair of enamelled wires in PTFE sleeve, another popularised by Sevik was glass fibre tape, another is to wrap the core and/or wire with plumber’s PTFE tape. Sleeving both conductors may be useful, and if the sleeve is of sufficient thickness, the enamel is no longer important. Unfortunately, thick sleeving increases Zo, and so has a usually undesired side effect. Sleeving the pair of enamel wires is pretty much a waste of time. 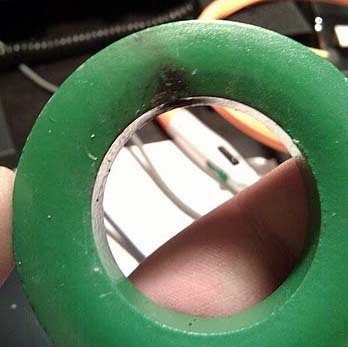 The following pics are from a 5kW rated commercial balun (advertised as PTFE sleeved), and it can be seen that arcing between the conductors has burned the sleeve, in this case at around 600W CW. What of the plumber’s PTFE tape? It is very popular but I have never seen any quantitative evaluation. I conducted a puncture test by wrapping a 3mm stainless steel rod with two grades of plumber’s PTFE tape with 50% overlap, so that it was a double thickness tested. The test probe rested with its own tip weight force against the insulated rod, around 26g or 0.255N. The doubled 38µm ‘white’ tape had an average withstand of 1.27kV RMS over 5 tests. The doubled 100µm ‘pink’ tape is 2.6 times thicker and had an average withstand of 3.08kV RMS over 5 tests, 2.4 times that of the white tape. The withstand may be lower with the higher winding pressure that would be encountered in a practical balun. Stretching the tape during application could be expected to reduce its voltage withstand. The practice of using additional insulation between wires and the cores is questionable for core materials that have very high resistivity. Material datasheets give resistivity, ferrites can range from 1 to 1e7Ωm, powdered iron is usually very low (though commonly rounded corners and epoxy coated). NiZn ferrites (eg #43, #62, #61) have resistivity typically ranging from 1e5 to 1e7Ωm and will not usually required additional insulation of the core. Low resistivity cores with sharp corners deserve special treatment. The simplest solution for a balun using twisted wires is to use suitably insulated wires. “Suitably” means high voltage withstand, low dielectric loss at RF. The wires that I have used successfully in such projects include PTFE insulated 7 strand silver plated copper, and XLPE insulated 19 strand copper. PVC insulated wires are a highly variable component, some I have measured have high dielectric loss, some low. It seems dependent on pigments, plasticisers etc and warrants measurement before committing to PVC insulation. Enamelled wire is cheap, and may purport to have quite high breakdown voltage, but puncture of the insulation is almost inevitable in uncontrolled antennas, and insulation damage is permanent, making the balun incapable of handling anywhere near its original power rating. Objective measurements of the performance of most recipes for improving the voltage withstand of baluns are scarce, these methods are mostly untested ‘magic’. It is unlikely that plumber’s tape is a good method of insulating the wires from each other. Plumber’s tape has around 10% of the dielectric strength of PTFE film value for PTFE film (Dupont 2010). Additional insulation of the core may be unnecessary, especially for high resistivity core materials. DuPont. Jun 2007. Teflon PTFE properties handbook. DuPont. DuPont. Sep 2010. DuPont™ Teflon® FEP FLUOROPLASTIC FILM. DuPont. Fair-rite. Jul 2013. Fair-rite catalog 17th edition. Fair-rite.